We have been waiting for this moment for months… It has been over two years since this project was announced. 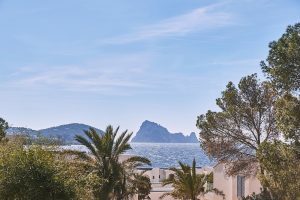 Seven Pines Resort Ibiza opens its doors in a privileged and unique location. We are not talking about “another five-star hotel in Ibiza”, we are talking about a new concept that offers its guests and clients the opportunity to “play hide and seek” enjoying total privacy and personalised service in one of the most astonishingly natural settings on the island. Seven Pines Resort Ibiza belongs to the prestigious hotel group “The Leading Hotels of the World” and is located in the area of San José, on the west coast of the island, between the popular beach of Cala Comte and the intimate beach of Cala Codolar, with Es Vedrà and the turquoise waters of the Mediterranean in the background. The new hotel complex offers impressive panoramic views and the privilege of being able to enjoy peace and tranquillity in an area that is renowned for its nightlife, famous DJs, night clubs and discos. These are the luxuries that are increasingly sought-after in Ibiza and the founders of Seven Pines Resort Ibiza are fully aware of this. Markus Lueck is the general manager of the resort and the person behind its conceptual design. A devoted hotelier with an extensive professional career, culinary culture and innovative vision, who not only thinks about offering an incredible experience to guests but also seeks to encourage and promote the search of talent within his team. The elegant beachfront resort is hidden between a dense pine forest, hence its name. The design of the 186 exclusive one and two-bedroom suites, some with a private swimming pool and garden, respects and blends in with the island’s natural environment. Guests and daily visitors are welcome to enjoy the delicacies at the Cone Club, The View and Pershing Yacht Terrace. The wide culinary choices available at the resort are designed by the prestigious executive chef Bijendra Yadav of Nepalese origin, who has an extensive professional background. Bijendra and his team have created unique flavours influenced by his trips around the world blended with authentic Mediterranean touches. 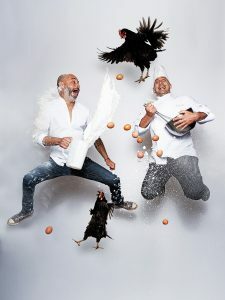 His culinary influences go back to Nepal passing through Darjeeling, United Kingdom and Middle East. 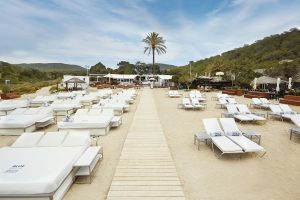 Situated in the resort, the Cone Club offers a casual and eclectic atmosphere with a beach club touch, offering us the seductive spirit of a bohemian Ibiza. Open all year round, from noon to midnight and with an around the clock service, the restaurant is divided into different areas: long communal tables to share with friends or to participate in an authentic Ibizan experience enjoying the company of complete strangers. 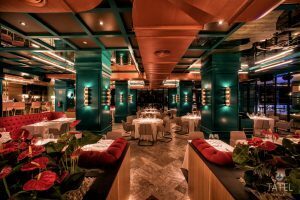 In the chilled setting of the Cone Club, guests can enjoy the best wines and most exquisite dishes influenced by Arabic and Oriental cuisine, with a distinct Mediterranean essence inspired by the chef Andrés Fernández, who has extensive experience in Michelin Star restaurants around Europe. The Cone Club has been created for guests to enjoy with all five senses the incredible sunsets, the pleasant sea breeze and extraordinary views, accompanied by a wide gastronomic offer and signature cocktails for all tastes. The View amazes guests with a series of delicacies to be enjoyed while absorbing the magnificent sea view. The restaurant is open for breakfast and dinner. The sacred bread oven and the long breakfast hours, which last until noon, guarantee an excellent start to the day. When the sun sets, the chef Seungmin Bae offers an original classic European style menu, as exciting and spontaneous as it sounds, inspired by Korean cooking techniques (such as steaming, fermentation and the robata grill), extracting the true essence out of each product and paying special attention to the selection of raw produce used. The restaurant offers an authentic culinary display. It has a table around the open kitchen, the “Chef’s Table”, which offers a special menu and allows guests to interact with the chef. 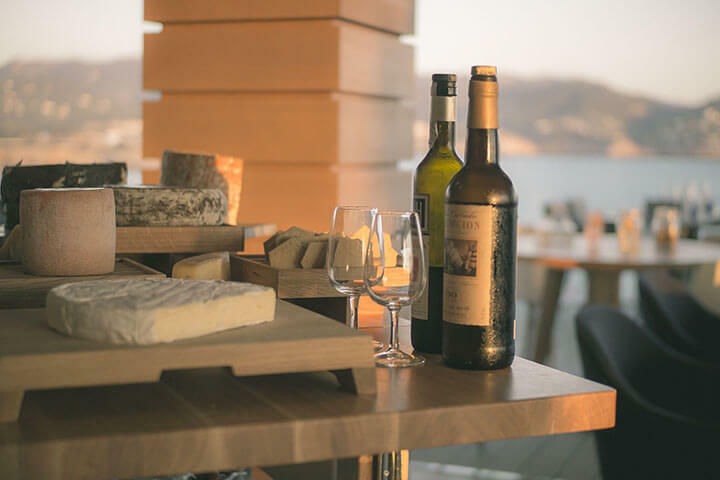 The two menus at The View are paired with an extensive selection of wines from the resort’s own wine cellar, one of the most precious jewels of Seven Pines Resort Ibiza. Located on the top of a cliff, Pershing Yacht Terrace is a sophisticated cocktail bar in the most spectacular corner of the resort. It is the perfect hideout to enjoy an aperitif, a drink, or a cocktail while the sun is setting. The cocktail bar is the first in the world to be designed by the Pershing Yacht team to show the admirable features of these emblematic yachts. An original conception giving clients the opportunity to feel as if they are on a nautical adventure surrounded by crystal clear waters. 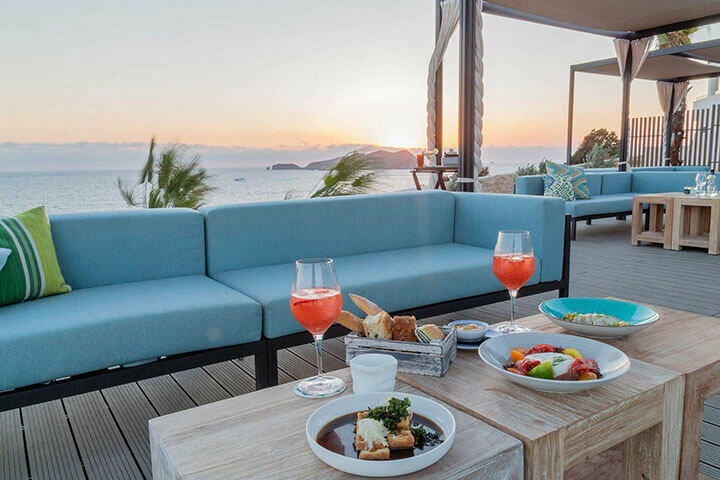 Luxury, gastronomy, relaxation and well-being: 7 Pines Resort Ibiza takes guests to a new luxurious dimension, possibly contrary to the meaning of this known concept until now. The silence, the sea breeze, the amazing beauty, the special attention to service and the maximum attention to detail, turn this resort into a reality never seen before on the White Island, only available to those that truly understand—and are willing to experience—this new meaning of “luxury”.